Looking for a good book for your teen to read? 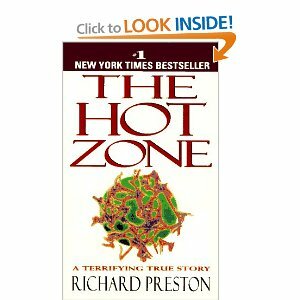 It is called The Hot Zone: A Terrifying True Story. Science, biology, viruses, non-fiction, and it is good. Yea, I read it too. My son is re-reading it for a research paper in Sophomore English. Oh, did I say what it was? The Ebola Virus. Scary stuff. His paper is looking good. He checked the internet for the most recent research and news and he has the thesis written and an outline. I am thinking we are making progress. Actually he is a very good writer. This is one of his talents. But he is interested in the subject too. That makes all the difference.